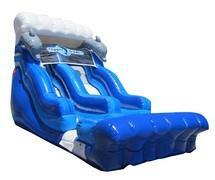 Make room for the biggest and best inflatables from FreshAirParty.com! Dry slides are a great way to complete an awesome festival fun zone by combining with some of our Bounce Houses, Combo Bouncers, and Interactive Games. Simply climb up the stairs on one side, then slide down the "no-jump" safety slide on the other. Big, bold and beautiful, these slides will have your guests lining up for a fun day. Browse the selections below and click on the image or "More Info" link for additional information and to make a reservation.